The state of Indiana has hired a public relations firms to strengthen its image as “a welcoming place to live, visit and do business.” The ‘damage control’ is occurring just weeks after a national outcry over its discriminatory religious freedom bill. 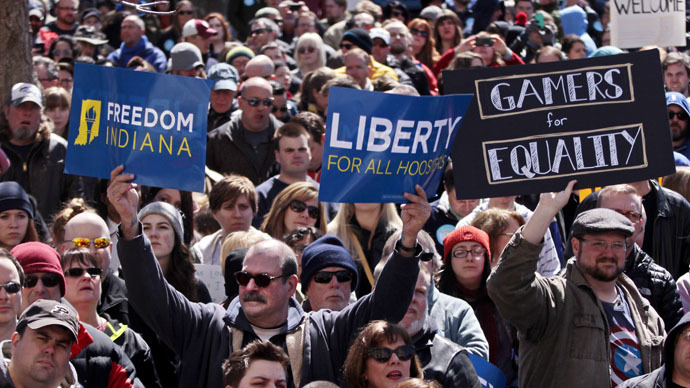 National criticism descended upon Indiana after its Religious Freedom Restoration Act (RFRA) – before it was revised – was understood to have allowed businesses to discriminate against gay, lesbian and transgender customers on religious grounds. The bill incurred national condemnation, with state governors in Connecticut and New York, as well as the mayor of Washington, DC, banning state-funded travel barring revisions to the law. The New York firm Porter Novelli was retained by the Indiana Economic Development Corporation (IEDC) to support ongoing public relations initiatives to continue strengthening Indiana’s global brand reputation. The AP reported the Senate Appropriations Committee added $1 million to tourism funding in the state budget specifically for that purpose last week. It is unclear whether any Indiana public relations firms were able to compete for the bid. Indiana Governor Mike Pence (R) signed the religious freedom law that would have allowed any individual or corporation to refuse service and cite religious belief as a defense when sued by a private party. National condemnation arose as it was seen that the law would allow businesses to turn away gay and lesbian customers for religious reasons.